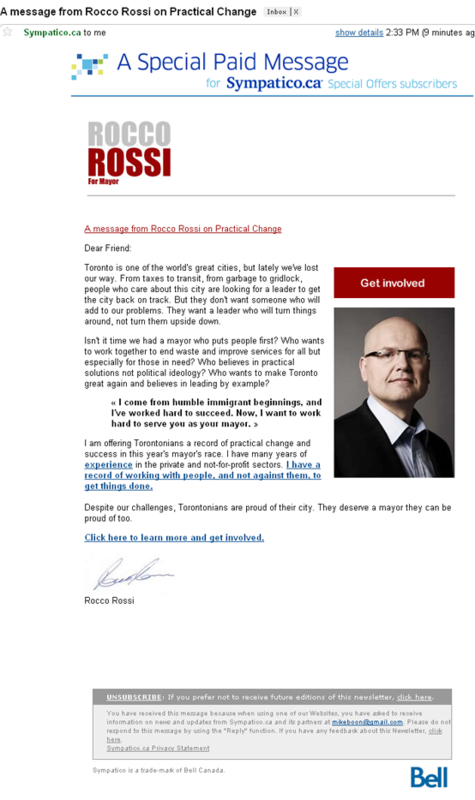 I just got an email from Rocco Rossi regarding his Toronto mayoral campaign. The subject line reads "A message from Rocco Rossi on Practical Change" and it's identified as "a special paid message for sympatico.ca special offers subscribers. Here's a screen cap of the email, sent to my personal email account. Click it to see it full-sized. I should disclose that I do a great deal of HTML email marketing as part of my job. I know the CAN-SPAM Act of 2003 like the back of my hand because I obey it fully, although that's an American act. The Canadian spam laws are less known to me, but this Sympatico list purchased rented by Rocco Rossi does include this statement. In theory, if I had opted in with Sympatico to receive updates from Sympatico.ca's partners, this isn't spam. Rocco Rossi "rented" the list and there is an opt-out mechanism within the email. So Rocco Rossi didn't just spam me, if I had opted in with Sympatico. But here's the thing. I'm very web savvy. I always, always uncheck such checkboxes when I register for anything. And, I don't believe I've ever dealt with Sympatico. Everything I have is with Rogers, and I've never received an email from Sympatico before. Maybe I was just spammed by Rocco Rossi. I got this email as well, and I have never dealt with Sympatico, and everything I have is with Rogers. And, I don't even live in Toronto. How serious can you take a mayoral campaign that resorts to using spam? Will Rossi be asking us to send in our banking information in order to get a piece of Toronto's budget surplus? If you got this email, I want to hear from you. Tell me if you've ever received a Sympatico partner email before, and if you opted in to receive such emails. Didn't Rossi work at sympatico? I didn't get the message and my internet is through Acanac, who resells Bell Sympatico high speed. Its spam...I don't care if people said they wanted the email or not. I got it too...and I'm not even in Ta-ran-ah! I think there's a sympatico/microsoft/hotmail tie-in. It was sent to my Gmail account. My MSN registration doesn't have that address, nor would I have opted in to have my address rented. Of course, that email would have gone to my never checked Hotmail addy. I've been all Rogers forever except for long ago when I had home phone with Bell. And like I said, I've never ever received a Sympatico list rental email before. My wife got one in her inbox and I deleted it before it even had time to materialize on the screen. Chances are now that I won't pay attention to anything Rossi says in the election 'cause it just left a bitter taste in my mouth. Bang on doors, not inboxes - at least I can ignore you the old fashioned way! We got it. We have nothing to do with Sympatico or Bell. Plus I ha when they try and hide the unsubscribe link. What, you paid Bell to spam, and Bell ensured that it wouldn't be blocked by SPAM filters- and under the guise of "partners" when people haven't entered a partnership with Sympatico. Call it what you want, it's spam dude. And if you do it enough, you'll lose the vote. 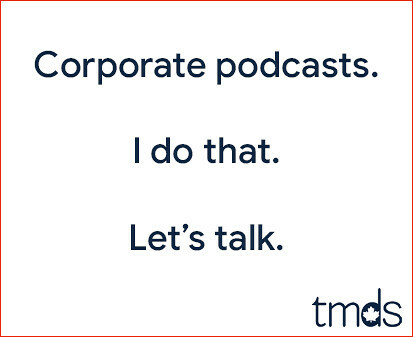 Its kind of interesting that Toronto Mike takes advertising for email campaigns on this very page! I hope they all operate by the same high standards. I agree with John Spraggs. Bell/Sympatico is not going to jeopardize their reputation on one email blast. Everyone above who says they have no idea why they received this communication did indeed, at some point, agree to accept news and updates from Sympatico. I have missed a box to click at one time or another, but I don't think we should blame a Toronto Mayoral Candidate for being creative on how he gets his message out through legitimate avenues. Unsubscribe if you have an issue with Sympatico. In this instance, I say, kill the messenger, don't kill the message. He's a reactionary who's angry about sharing the road with cyclists. He exemplifies the kind of visionless and self-serving politicians we should avoid. I've been watching this conversation with interest (I have an interest in email marketing and its capabilities within the political spectrum), and I'd have to side with John and Dutch. The simple fact is, as much as I loathe Bell/Sympatico, it's not very likely (less than 5%) that they would violate legislation like CAN-SPAM. The financial risks (among others) are simply too high to warrant such an action. Judging by the screenshot, everything looks legitimate (I didn't receive the email, although I'm sure I've probably opted in as I was a Sympatico customer many years ago, or visited a partner site, which I'm sure there are many). I'm certainly not pointing fingers at Mike, but given what I know about email marketing and what I see here, I think this might be a case of not remembering accurately whether he opted in at some point.